New data on poverty, income, and health insurance coverage released by the U.S. Census Bureau reveals decreasing poverty rates in most states served by HOPE Credit Union. However, Mid South residents in Alabama, Arkansas, Louisiana, Mississippi, and Tennessee continue to experience poverty at rates well above the national average. Moreover, while poverty rates have decreased in communities of color throughout the Mid South, there remain significant gaps between communities of color and White communities. 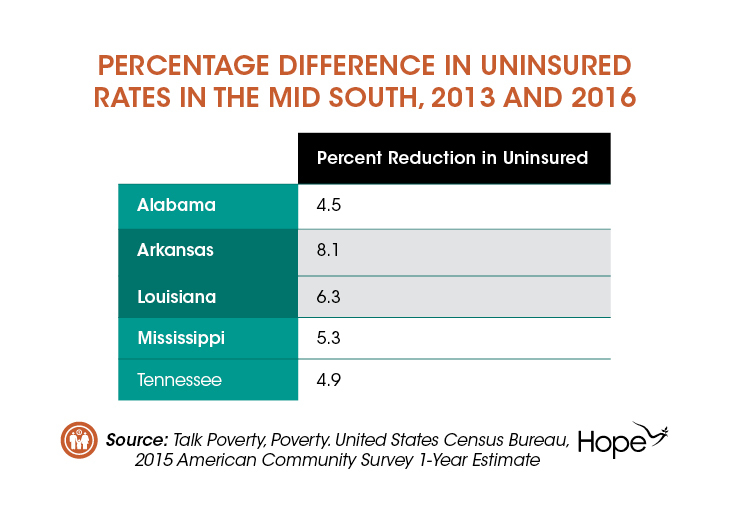 Lastly, this data also shows that the number of uninsured residents has decreased throughout the Mid South, particularly in states that expanded Medicaid coverage under the Affordable Care Act (ACA). The latest data reveal decreases in overall poverty between 2015 and 2016 in every state served by HOPE Credit Union, excluding Louisiana, where the poverty rate remained unchanged during this period. 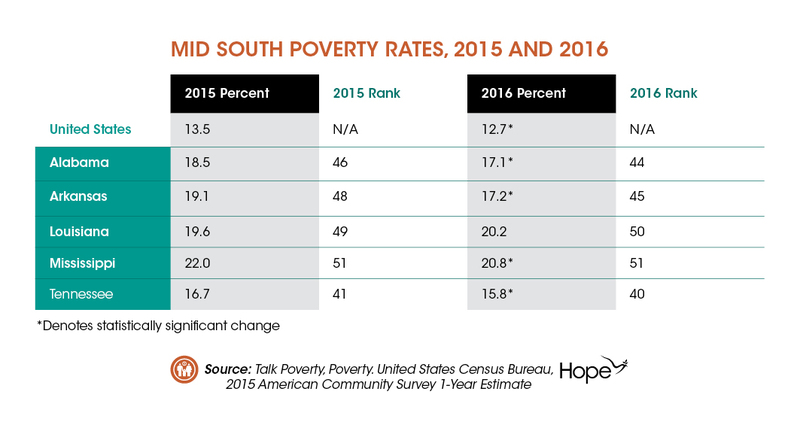 However, states in the Mid South remain substantially above the national average of poverty. Mississippi and Louisiana have the highest and second highest poverty rates in the nation, 20.8 percent and 20.2 percent, respectively. See Table 1. Trends in child and family poverty largely align with the trend for overall poverty, although higher proportions of children in each of these states – up to 31 percent in Mississippi – live in poverty. In contrast to the notable reductions in poverty, median incomes have stalled throughout the Mid South. Arkansas was the only state to experience slight growth (4%) in median income between 2015 and 2016, while Louisiana’s median income slightly decreased (2%) in the same period. 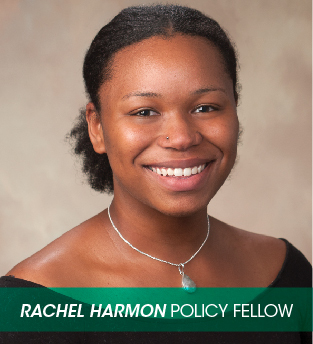 Analysis of overall economic indicators often obscures significant racial inequalities. Between 2015 and 2016, there were promising declines in the percentage of African Americans living in poverty in Alabama, Arkansas, and Mississippi. In Louisiana, the percentage of African Americans living in poverty increased, while Tennessee’s rate remained the same. Despite an overall trend toward racial parity, poverty rates for Black and Latino communities remain disproportionately high in the Mid South. In every Mid South state, African Americans and Latinos experience poverty at about twice the rate of Whites. See Table 2. The scale of poverty in Mid South communities of color is important to understand. In 2016, there was no state in the Mid South where less than one out of every four African Americans was living in poverty. This is also true for Latinos in every state except Louisiana. Similar patterns hold for median annual income where, despite increases in the median income of African Americans in Alabama, Arkansas, and Mississippi, African Americans earned between 49 and 56 percent of the median income for Whites. Latinos experienced no change in median annual income and earned between 70 and 79 percent of the median income of Whites. The percentage of uninsured residents decreased in every state in the United States between 2013 and 2016, reflecting the effectiveness of the ACA, even in states where ACA Medicaid expansion was not adopted. This pattern held in the Mid South, with each state experiencing meaningful decreases in their uninsured population. However, the only states to experience reductions higher than the national average in the Mid South were those that expanded Medicaid: Arkansas and Louisiana. Arkansas, which expanded Medicaid in 2013, reduced its uninsured population by nearly twice that of Mid South states that have yet to adopt the expansion. See Table 3. This data points to the importance of expanding Medicaid, particularly in states that have populations that have been historically underserved by the health insurance market. The most recent data from the U.S. Census Bureau demonstrates an important truth: policy decisions, such as enacting a state Earned Income Tax Credit (EITC) or expanding Medicaid, drive state outcomes related to the health and well-being of their residents. States in the Mid South have, on the whole, failed to adopt the necessary policies to support healthy and thriving communities. This will continue to be evident in the data until that fact changes.